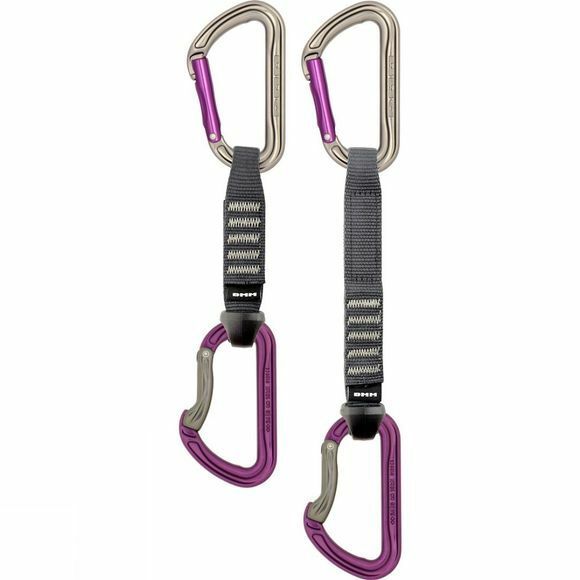 The DMM Shadow is a classic sport climbing biner, which is strong and robust, as well as being light and easy to handle. It has an I-Beam construction to reduce weight without compromising strength and clean nose closure to reduce snagging when you are clipping or unclipping. There is also a handy thumb grip on the straight gate for easier operation. The Shadow Quickdraw pairs the Shadow up with the Shadow Bent Gate, with its deep basket to guide the rope toward the spine, at either end of a lightweight variable width (VW) nylon sling: the best option for the majority of single pitch sport routes because it is easy to handle tough and durable.